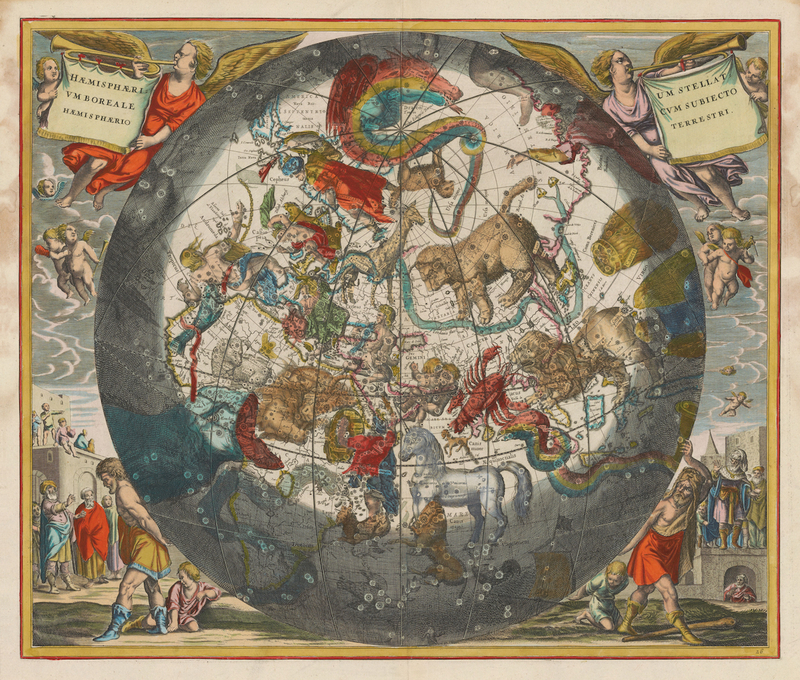 Harmonia Macrocosmica (1660), an atlas of the stars from the Dutch Golden Age of cartography, maps the structure of the heavens in twenty-nine extraordinary double-folio spreads. 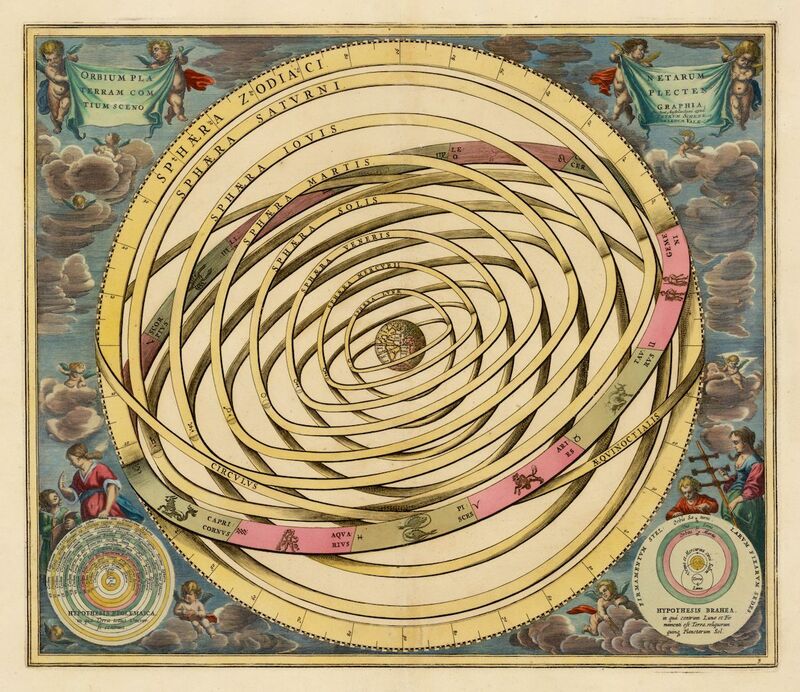 We are presented with the motions of the celestial bodies, the stellar constellations of the northern hemisphere, the old geocentric universe of Ptolemy, the newish heliocentric one of Copernicus, and Tycho Brahe’s eccentric combination of the two — in which the Moon orbits the Earth, and the planets orbit the Sun, but the Sun still orbits the Earth. 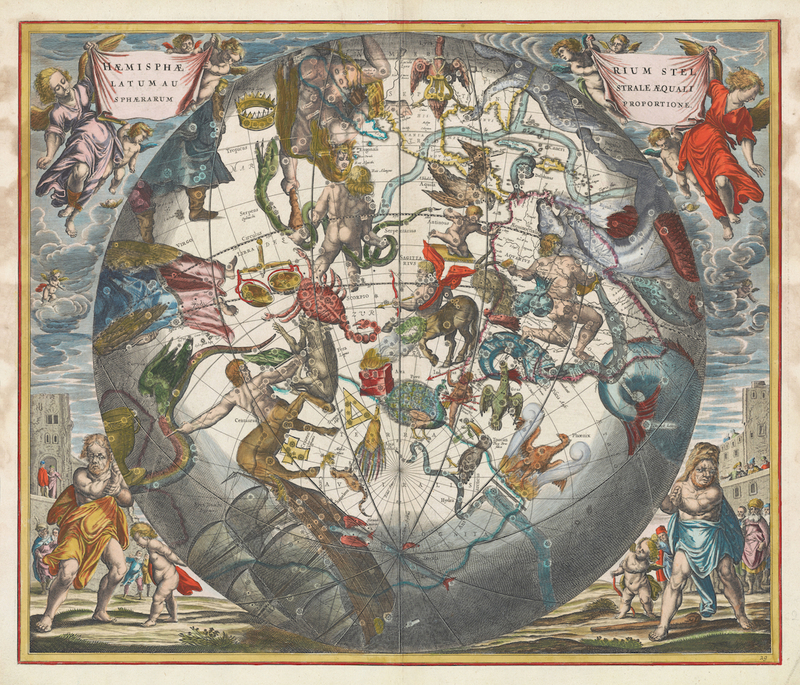 The marginal area of each brightly coloured map is a hive of activity: astronomers bent over charts debate their findings, eager youngsters direct their quadrants skywards, and cherubs fly about with pet birds in tow. The life of the Dutch-German creator of the folio, Andreas Cellarius, has only come down to us in skeleton form. He was born around 1596 in a small town near Worms and spent his adult life as a schoolmaster in Amsterdam, the Hague and finally Hoorn. 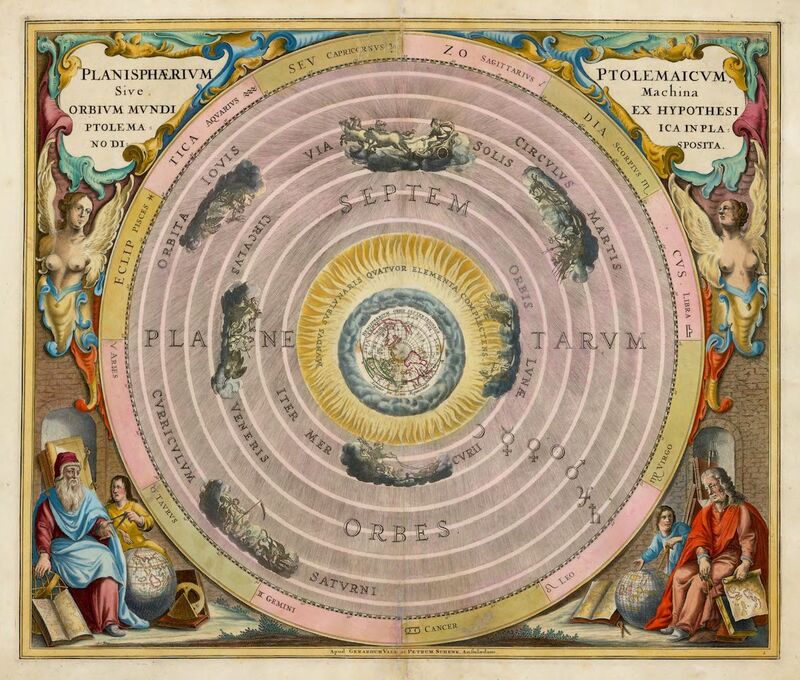 Around 1637 he was appointed rector of a Latin school in Hoorn where he wrote the Harmonia Macrocosmica and all his other scholarly works (including one on designing impregnable fortifications). 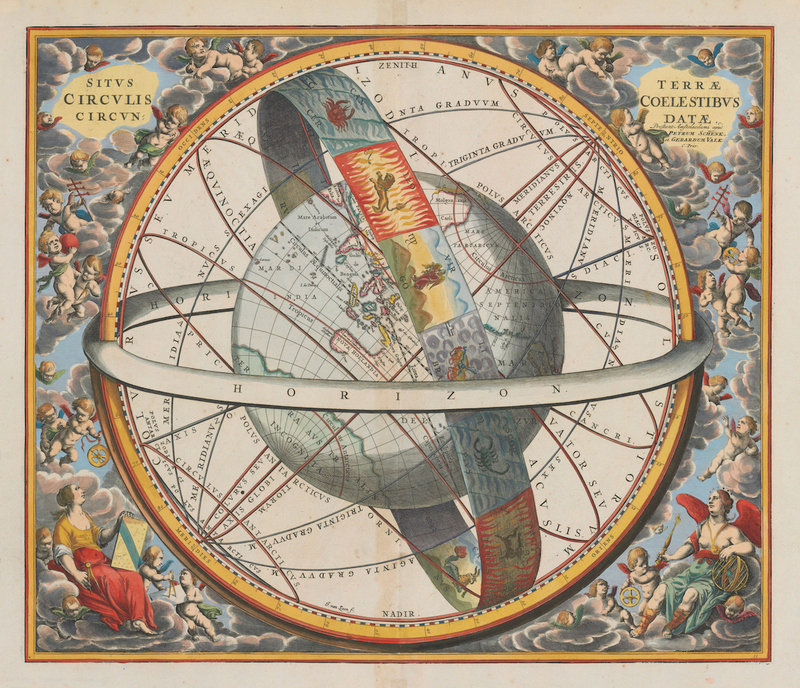 Intended as a historical introduction for two-volume treatise on cosmography, only this first part, printed by the Amsterdam publisher Johannes Janssonius in 1660, was ever realised. 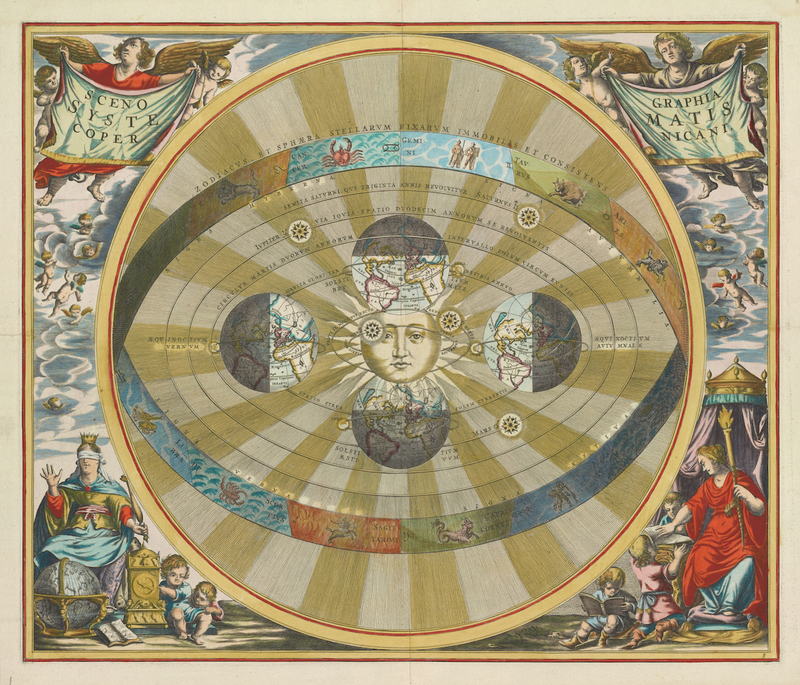 In 1708, some forty years or so after Cellarius’ death, the Amsterdam publishers Gerard Valk and Petrus Schenk the Younger published a version just containing the plates, and it is this later edition from which many of the images in this post come. The highlights we’ve featured here all sourced from the digital repository of Stanford University Libraries, however in two separate collections each with different licenses regarding sharing and re-use. Six are from The Glen McLaughlin Map Collection of California as an Island and published under the Public Domain Mark and seven are from The Barry Lawrence Ruderman Map Collection which is (frustratingly and for seemingly no good reason) published under a CC BY-NC-SA license (so be careful how you use those). 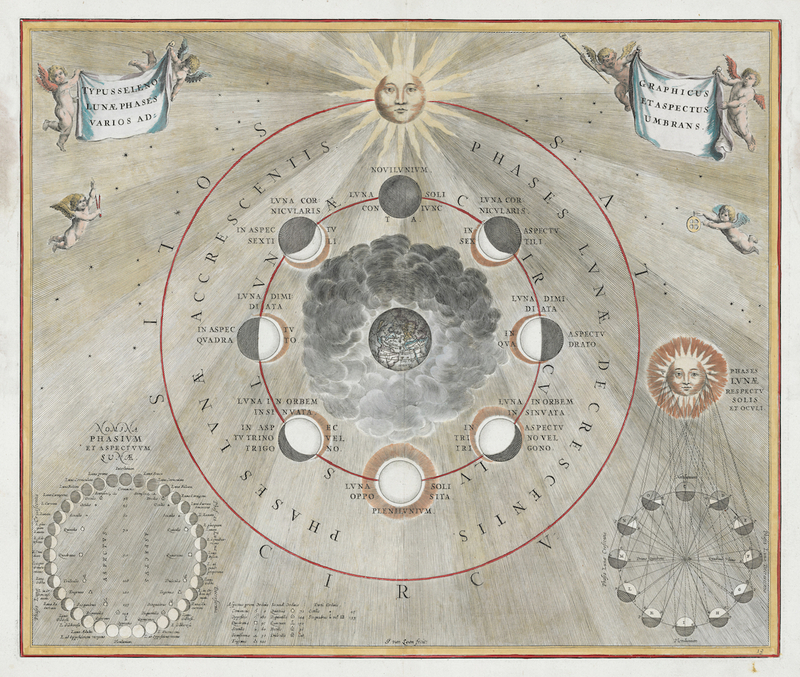 In 2006, Taschen produced a colossal reprint of the Harmonia Macrocosmica, with a commentary by Robert Van Gent. And we’ve also got a selection available as prints in our online shop. Download: Right click on image or see sources for higher res versions. 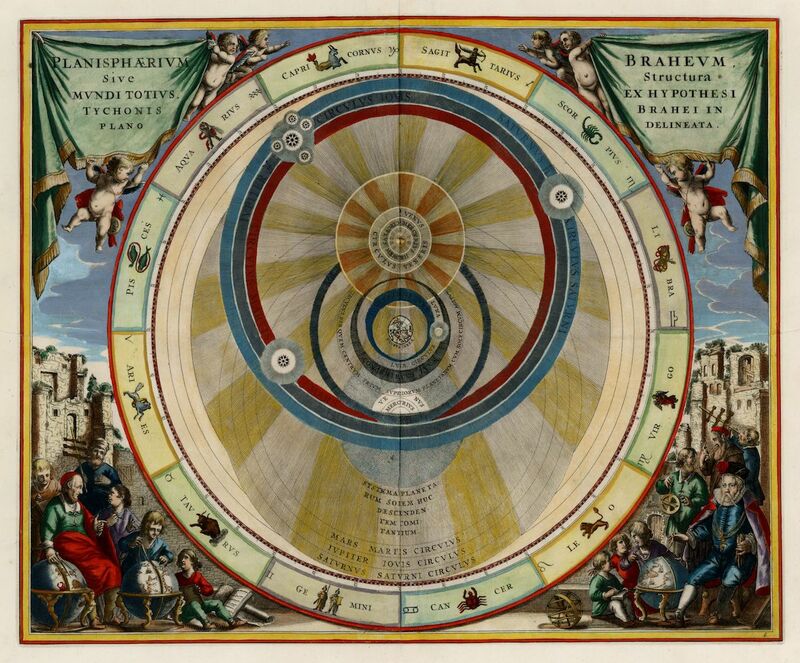 Aratus’ Model of the Universe — Source. 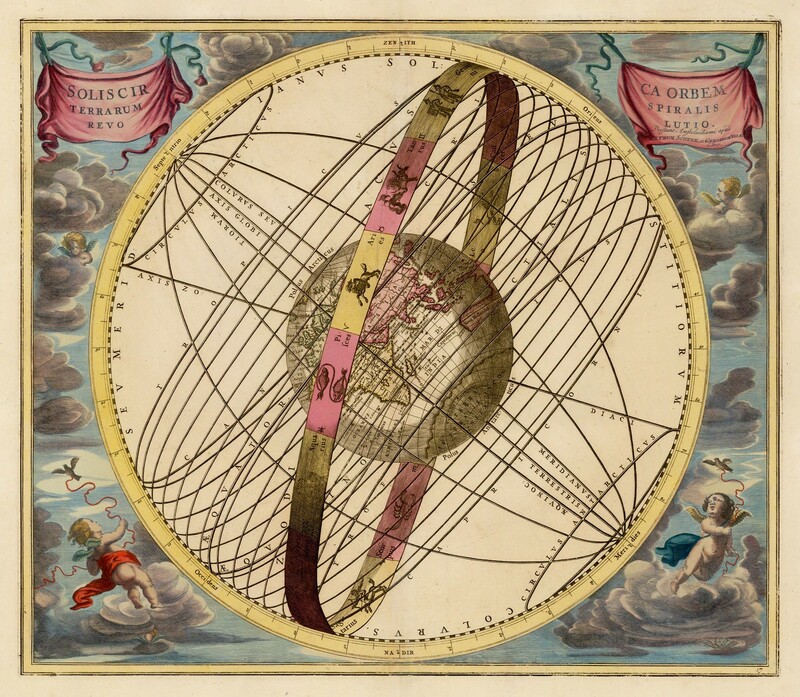 Southern Celestial Hemisphere — Source. 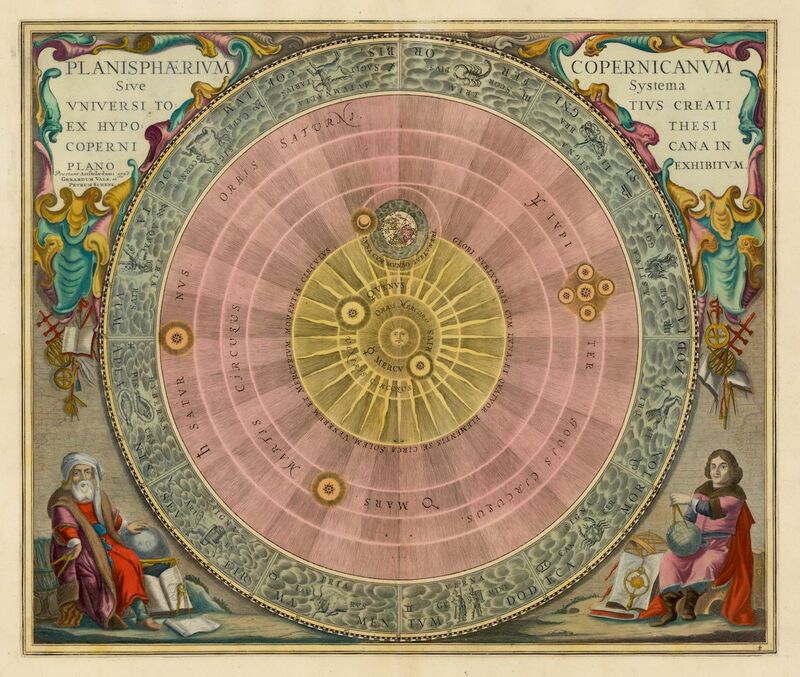 Copernican System of the Universe — Source. Selenographic Phases of the Moon — Source. 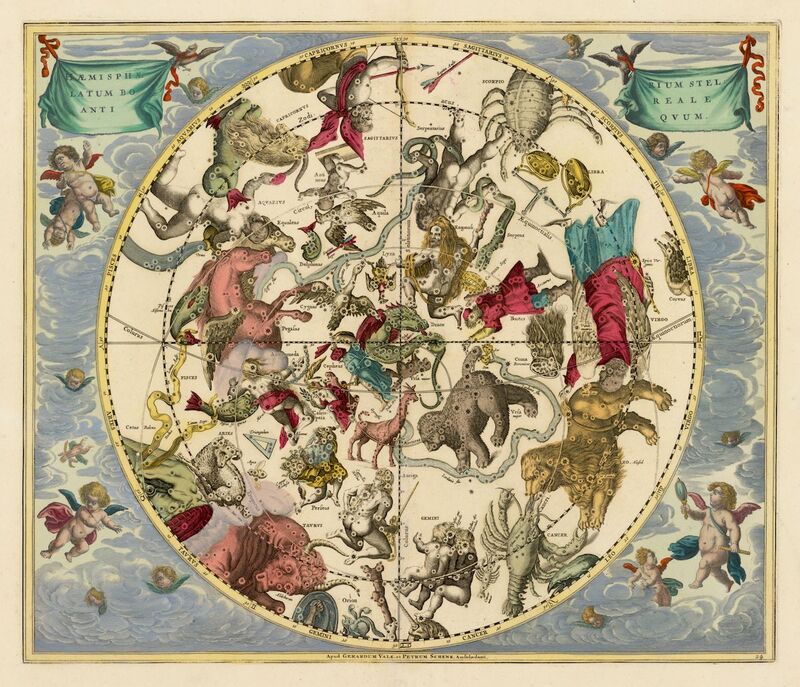 Northern Celestial Hemisphere — Source. 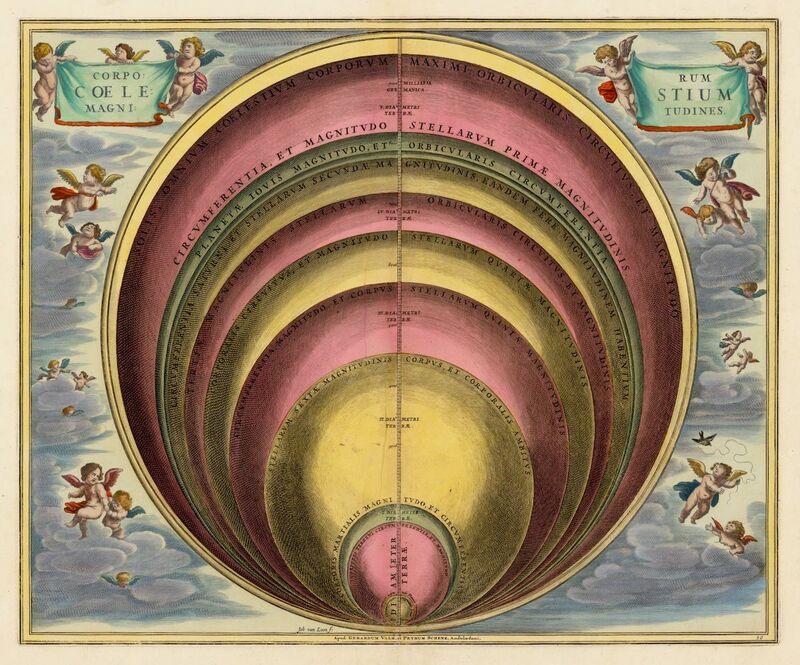 Ptolemaic View of the Universe — Source.